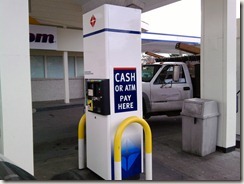 On Thursday, on my way to get car tabs, I stopped at an ARCO gas station to get gas and cash. I pulled up to the pump and inserted my debit card into the ATM. Of course, there was a 45-cent convenience fee (actually not bad for a cash machine). After I started pumping gas, I examined the ATM a little more; it soon became clear that there wasn't an option to get any cash from this machine. I was paying 45-cents for the convenience of using ARCO's gas pump, which is odd because Shell and Chevron don't charge extra fees for using their gas pump. I felt a little swindled by ARCO. I think most people would agree that an ATM should include the ability to spit out some cash. Even if you pay with a debit card at Safeway or 7-11, there's usually an option to get back some cash. And they don't charge you a convenience fee. You can pay on the gas island with cash or your ATM card using PayQuick, It�s an easy way to purchase at the pump to get in, out and on your way quickly. To avoid the 45-cent convenience fee, use your ARCO Debit MasterCard. Plus you can earn reward points when you use it! Because I was in a hurry (and I needed cash for the emissions test you have to get in Washington state), I went inside to see if they had a real ATM. They did, but now they wanted $2.00 for the convenience of withdrawing cash. The worst part was that I did pay the $2.00 convenience fee at the real ATM, because I was in a hurry. I know that ARCO was counting on this, but you would think they'd be interested in forming a long-term relationship with me so I'd be willing to return to their store and buy snacks -- because that's where the real profit is.